ISRG is trading near all time highs and has earnings out after the bell today. I've noticed that when stocks are near all time highs and look to be overvalued, that they tend to dissapoint. (except for FSLR which DT got screwed on when it gapped up like 50pts). Anyway, looking at the options on ISRG which expire tomorrow, you could sell some out of the money calls 50pts OTM and collect $300 for every contract so as long ISRG doesn't gap up over 50pts on earnings, putting it up over 400pts (which is ridiculous IMO). I think this stock is going to drop on earnings, however the healthcare feild is still going strong even during these times of economic instability ,,,cough,,recession...The risk of the trade, well if ISRG pops up say, 70pts, then you could be out around $2,000 for every contract. Needless to say, these options are juiced for a big move either way. If you wanted to hedge this trade, you could go long a certain amount of shares, or go long a further out call option, but the real money is going to be made selling the right options ahead of earnings. To get some practive trading earnings, I've put on a trade on the simulator account. I bought 100s ISRG, sold 1 ATM call strike 350, and bought 1 ATM put strike 350 which both expire tomorrow. I lost around $150 due to the crappy bid ask spread. nice to see you trading again. 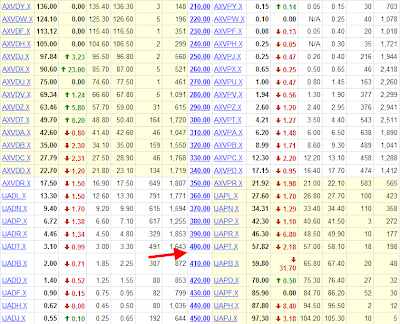 but looks like you nailed your fat paid b/a spread with that short term conversion. losing this edge is hard. being overnight too short vega in these low market vola days can be quite risky, esp in such high level stocks. if they are before earnings too. a decent jump in broad market vola next day ... you could be raped hardly. gamma jammer provides an nice rocking blog on his option trading. nice trade on POT, i was eyeing that too, but decided to go short MON.